If you perform work that involves sharing documents or collaborating directly with vendors, clients, or customers, then you might want to share content on your Team site or OneDrive for Business with people outside your organization who do not have licenses for your Office 365 Small Business subscription. You can send users a guest link that they can use to view individual documents on your site anonymously. If you’re looking for more information on sharing a document or site and who is considered an external user, see Share SharePoint files or folders in Office 365. Note: These steps apply to Office 365 Small Business, which is no longer available for purchase. If you're using a different Office 365 plan, see External sharing overview. If you’ve shared an entire site with a user, then that user will be able to log in to the site and function like a full member of the site. They will be able to browse, search for, view, and edit content (depending on which permission group you assign them to). They will be able to do things like see the names of other site users in the People Picker or view document metadata. External users will also appear in the People Picker as site users. This means that other people who use your site could grant different permissions to these users than you initially granted when you shared the site with them. Be sure you know the identity of external users before you invite them to your site. If you invite external users to your Team site, they will be able to view content on the Team site and all subsites. If you want to avoid having external users gain access to important or sensitive content on your Team site, you should create a subsite of your Team site that has unique permissions, and then share only that subsite with external users. To learn more about permissions inheritance, see What is permissions inheritance? Similarly, if you want to share a subsite that you’ve created on your OneDrive for Business site, you will want to ensure that it has unique permissions so that you do not accidentally grant users permission to additional sites or content on your OneDrive for Business site. If you share documents using anonymous guest links, then it is possible for invitation recipients to share those guest links with others, who could use them to view content. Do not use guest links to share documents that are sensitive. If you want to minimize the risk that someone might share an anonymous link, share a document by requiring sign-in instead. To whom do you want to grant access to content on your Team site and any subsites, and what do you want them to be able to do? To whom in your organization do you want to grant permission to share content externally? Is there content you want to ensure is never available to be viewed by people external to your organization? The answers to these questions will help you plan your strategy for content sharing. If you want to share a site, but you also want to restrict external users from gaining access to some of your organization’s internal content, consider creating a subsite with unique permissions that you use exclusively for the purpose of external sharing. Provide someone outside your organization with ongoing access to information and content on a site. They need the ability to perform like a full user of your site and create, edit, and view content. Share a document and require sign-in. Provide one or several people outside your organization with secure access to a specific document for review or collaboration, but these people do not require ongoing access to other content on your internal site. Share a document, but don’t require sign-in. Share a link to a non-sensitive or non-confidential document with people outside your organization so that they can either view it or update it with feedback. These people do not require ongoing access to content on your internal site. When a document has been shared through a guest link, you can see this information in the properties menu for the document. 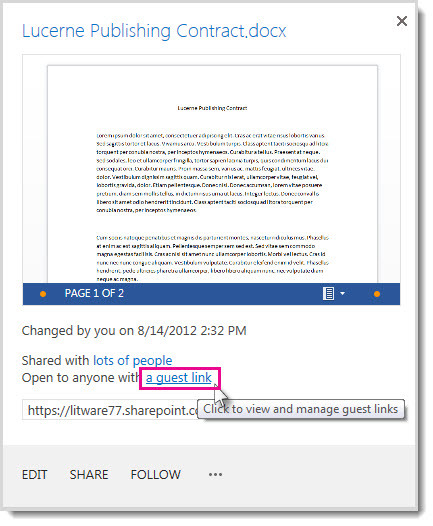 To learn how documents can be shared through guest links, see Share SharePoint files or folders in Office 365. You can revoke access to a document that has been shared through a guest link by disabling the link. Go to the library that contains the document for which you want to remove a guest link. Point to the document, and click Open Menu. Click a guest link in the sentence Open to anyone with a guest link. Next to the URL for the guest link, click the Delete button. When you are asked if you want the link disabled, click Disable Link. When people outside your organization attempt to access the content using the guest link, they will see a message indicating that they cannot access it. Under External User Invitations, find the person you would like to uninvited to the site and click Open Menu. If the external user has already accepted an invitation, and you want to remove their access, you can do so by removing them from the SharePoint permissions group to which you assigned them.